From the moment that the starting gate slams down and you and up to seven other racers blast at a full sprint toward the first obstacle, BMX racing will give you that rush of adrenaline you’ve been looking for. Big jumps can mean big air. Steep backsides, deep turns, and downhill sections can add up to massive speeds. To realize the total thrill that BMX gives a rider, you really need to experience it. With over 370 BMX tracks located all around the country, there is surely a USA BMX facility near you. Once you try BMX racing, we practically guarantee you’ll be hooked for life. That is the cadence you’ll probably hear from the starter as the gate is about to fall in front of you for the very first time. But before you go all out, first take a moment to scope out the track. Watch a few laps of practice and memorize how some of the good riders are going around. Take mental notes of where they ride in the turns and where they pedal and where they stop pedaling. Keep in mind that, in the beginning, you probably wont be able to jump like they do; that will come in time. Your first few laps around the track should be slow. Take it easy. By all means, don’t go all-out on your first lap! Take time to familiarize yourself with the course so that you know what jumps are coming up and what it feels like to go over them. It will be totally different once you take the track at faster speeds. As you’ll soon find out, a good start can be the difference between first and eighth, so we’d suggest working on your gates as much as possible. And remember that all-so-true saying, “Practice makes perfect.” So… practice, practice, practice. State / Provincial Champions – Every track in your state/province will hold a State/Provincial Race. To become State/Provincial Champion, USA BMX counts your best scores from the SCR’s (or PCR’s). Do well at the State/Provincial Finals, and you could call yourself Champ! Race of Champions – First, you must qualify for the Race of Champions (ROC) by competing in the State/Provincial Championship Series. Then, you must win the ROC (the Friday pre-race at the Grands) to earn this coveted #1 title. Gold Cup Champions – To get this #1 plate, you must first qualify at a Gold Cup Qualifier. Then you’ve got to attend your designated Gold Cup Finals (East, Central or West) and compete Saturday and Sunday with the best in your region for a chance to earn the Gold Cup #1 plate. Gold Cup plates are awarded to the top 3 riders in each class. District Champion – The sixth step in the “Stairway to Success” is to earn a low District Number. Becoming “District #1” in your area is a major accomplishment. National Age Group – If you’re not able to get National #1 Amateur, you might still be able to NAG #1 out of all the kids your same age, in the entire nation. NAG plates are awarded to the top 10 riders in each class. 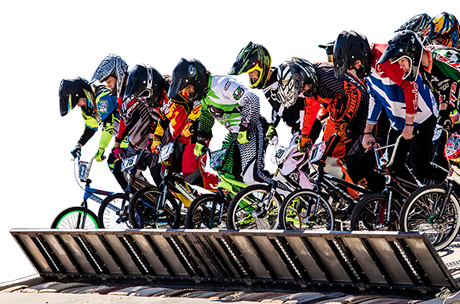 National #1 – This is the highest ranking in USA BMX, awarded to only seven riders each year. #1 plates are awarded in AA Pro, Girl Pro, Vet Pro, Boys, Girls, Boys Cruiser, and Girls Cruiser.